Only SoV judges can vote to review. Thank goodness for that FAQ, because otherwise one might ask is Theracus could do it with the glyph of Rannveig in play. Without any synergies worth noting (being only half an orc isn't good enough for the Blades or Heavies), Thrangir is a stand-alone melee hero. As such he needs to either fill a role, or, as in this case, stand well on his own. And stand he does, against even potent heroes and squads. The most obvious comparison point is Eltahale, who has similar stats and the same price. Eltahale's powers make her more mobile, able to go after prime targets, while Thrangir's focus is more on survivability. That makes it difficult to compare them directly, but the cost seems to be in the ballpark. There are other comparisons that can be made, but it is difficult to draw direct conclusions based on stats for costly solo heroes as their powers are very diverse and often dominate the designs. A tough-as-nails champion who recklessly bashes his way through his enemies? Works for me. I don't have a problem with a half-orc working for Jandar either; half-orcs are the classic "unlikely hero" race in D&D. The design fits the look of the figure very well. One problem I have with the theme is the Move of 6. That's unusually high for a heavily-armored figure and even for many lightly-armored ones. Yes, Eltahale has a Move of 6 as well, but mobility is kind of her thing. Given Thrangir's overall design, it doesn't seem necessary or particularly fitting to me. Not a deal breaker on its own, but it never felt right. While it isn't the simplest design I've come across, it's definitely not complicated, and I appreciate seeing that in a solo hero. Reckless Barrage provides an interesting choice point, and the interaction between Reckless Barrage (the way it is intended to work) and Resilience makes for some fun desperation choices. As I mentioned above, a solo hero without direct synergies needs to find his own way to provide value to an army. Thrangir doesn't try to fill any particular role (though he can pose as a defender about as well as any hero), rather he simply proves his worth by recklessly pounding his way through (hopefully) his points' worth or more. While he doesn't have any movement tricks other than a better-than-average Move stat, his very solid stats backed with a bonus attacking power and a very good defensive power make him able to do the job. An unrestricted (but potentially self-wounding) triple attack makes him valuable against both heroes and squads. Resilience is actually frighteningly good. 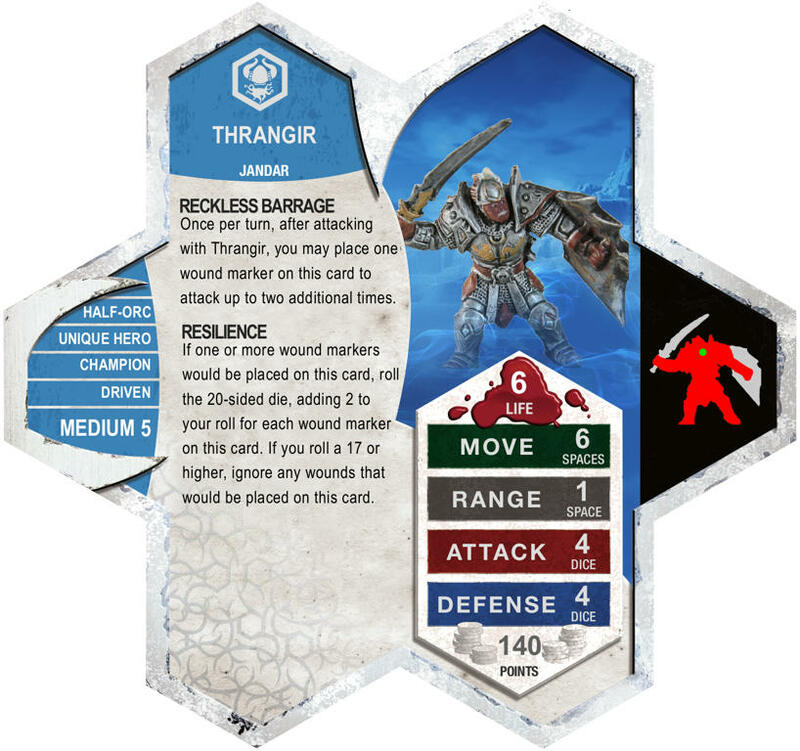 Since you add 2 to your 20-sided die roll for every wound marker on his card, once Thrangir is up to 5 wounds he only needs to roll a 7 to ignore any wounds. Of course he is nearly dead at that point, but that's a pretty reliable power. When the d20 is hot, combined with his solid Defense of 4 Thrangir can appear unkillable. After quite a bit of testing, though, I decided it's not out of line. Powers like these are a naturally very swingy, making it seem ungodly good in some games and a severe letdown in others, making it very difficult to accurately judge. Normally, just when I found myself getting cocky and trying to rely on Resilience, a poor roll would end it for me. That's about what the power should be, I think. Note also that the power is not nearly as good as Isamu's Vanish. Where Isamu can run away with a successful Vanish, often ensuring he won't get attacked again that turn, Thrangir often has to survive multiple attacks. I really like the choices Reckless Barrage requires. A single attack of 4 is ok but nothing special, but three attacks of 4 is potent. When you start getting low in health, the decision to risk a wound to take the extra swings becomes more and more difficult, even though his Resilience gets better and better. Many times I found him surrounded by enemies with only 1 Life remaining, trying to decide if it's worth risking a self death to get those extra attacks. However, as much as I like how the interaction between Reckless Barrage and Resilience plays out, it never felt natural to me. A power where you take a wound (or risk taking a wound) to get a benefit and a power that negates wounds don't seem right together, and it was oddly easy to forget to roll for Resilience when using Reckless Barrage. I almost felt like I was "cheating" when I would choose to take a wound to get the extra attacks, but then resist the wound I chose to take. I compare this with Eltahale's Thunder Step, where the chance of a self-inflicted wound never seemed odd or hard to remember. Thrangir does exactly what he is designed to: charge recklessly into enemy lines and bash away while shrugging off attacks. He is effective for the price and provides some tough decisions and gambles. Unfortunately, the interaction between Reckless Barrage and Resilience, while interesting, never felt right to me. Additionally, the Move of 6 seemed unnaturally fast for such a heavily-armoed figure. Together, it made the unit feel more like a (fun) custom than a well-refined SoV inductee. The concept is something I can get behind, but not quite the implementation. I vote to induct Thrangir into the SoV. I will vote No on Pavin Nahz by Arch-vile because the mechanics of cover shot are a theme fail. Let me explain, if I am understanding the current power (it is pretty clearly written so I don't think I have this wrong) Pavin can shoot a guy 8 spaces to his left and then 3 heroes 8 spaces to his right can move. How is it a cover shot when the figures moved start 17 spaces away from the target? That doesn't work for me. Sounds exactly like Agent Skahen. Except she does not grant Disengage to the figures she moves. That is a significant difference. Also I think you could argue that Pavin can move himself with his version, especially since Skahen's power states that she cannot be moved by her power. CSSA specifies "other" unique heroes, and Pavin should not be able to move himself with that power. Adding an extra sentence to clarify would be fine, if it helps. Last edited by Arch-vile; July 26th, 2013 at 10:39 AM. Reason: Plus, Pavin can't be within clear sight of himself. I wasn't talking about the power. I was talking about your description of the power. Fair enough, but I don't care for the mechanics/theme of her power either. I don't expect this to change your mind, caps, but I found precedent for referencing only Unique Heroes when squads should be able to benefit, thematically and mechanically. Whether or not squads should be able to benefit from that power is pretty debatable. Last edited by capsocrates; July 29th, 2013 at 01:07 AM. Reason: You can probably find debates on that subject in his Workbook even. Fair enough. I wasn't around when Myrddin was designed and I haven't read his WorkBook. The point is, there is already a card unifying Unique Heroes, so your argument about "small, medium, and large Unique Heroes" not being a category of synergy is discredited by Myrddin's existence. VC has already gone down the path of Unique Hero synergy, so Pavin Nahz breaks no new ground there. If I should take this to PM or elsewhere let me know, I don't want to clog the SoV thread.